The road to getting an excellent job is never in a straight line. Often, it is filled with twists, turns, secrets, surprises and (maybe) a few missteps. Many job seekers send out their resumes of recruiters and human resources departments and pray for the best. In many cases, they are left the dark about exactly what goes on behind the scenes in hiring. This uncertainty makes it difficult to be effective in a job search; the process is little more than a guessing game. When hiring, HR departments have one clear goal—to wade through a flood of resumes and applications, searching for the best candidates with the skills and abilities that the employer needs to do the job. Although some HR departments are tight-lipped about the screening process, others are willing to draw the curtain back, giving a glimpse of what actually happens after the resume is submitted. 1. “Once you’re unemployed more than six months, you’re considered pretty much unemployable. We assume that other people have already passed you over, so we don’t want anything to do with you.” -Cynthia Shapiro, former human resources executive. 2. “When it comes to getting a job, who you know really does matter. No matter how nice your résumé is or how great your experience may be, it’s all about connections.” -HR director at a health-care facility. 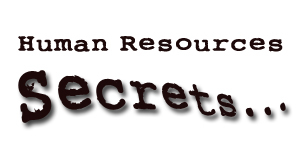 Have any HR secrets of your own? Let us know in the comments! Is It My Job to Fire Employees? Does your name affect your job search? ‹ PreviousOne More Thing… Teamwork!